Monday-Tuesday, April 8-9 – 10th Anniversary Conference: Global Mental Health Research without Borders, Bethesda, MD. The NIMH Center for Global Mental Health Research and Grand Challenges Canada will co-convene the 10th anniversary global mental health conference in 2019, bringing together researchers, innovators, and other stakeholders around the theme of Global Mental Health Research Without Borders. The conference will showcase findings from cutting-edge science and identify opportunities for groundbreaking research to address the Grand Challenges In Global Mental Health. Tuesday, April 9 – BBRF Webinar – “Circadian Rhythms and Bipolar Disorder,” Register here. 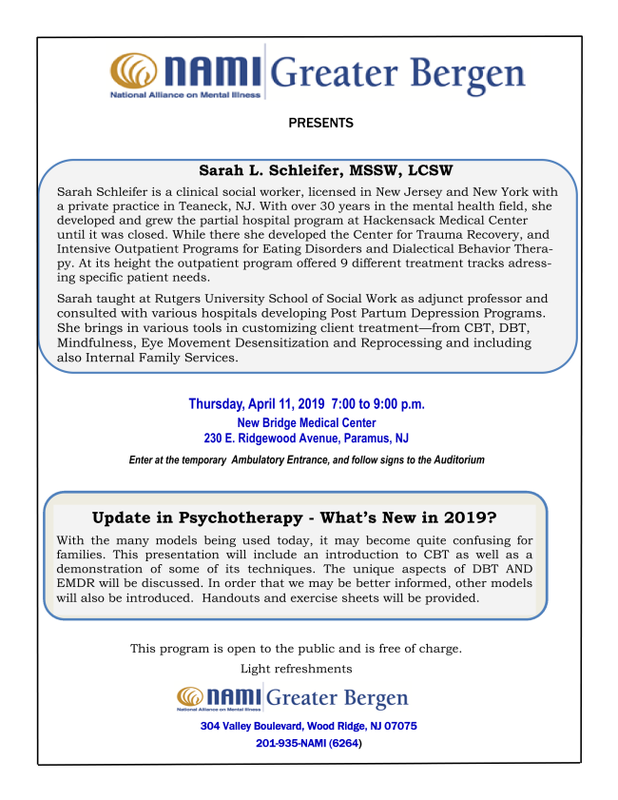 Thursday, April 11 – NAMI Greater Bergen presents a free public workshop, 7-9pm, at New Bridge Medical Center. View flyer. Friday, April 12 – Webinar: How Can RDoC Inform Suicide Intervention Research and Treatment? 12:30-1:45 PM ET. In April 2019, the NIMH Research Domain Criteria (RDoC) Unit, the Delaware Project, and the Association for Behavioral and Cognitive Therapies will conduct the third webinar in a series examining the science-to-service pipeline in psychology and psychiatry. Tuesday, April 16 – NJ Partners invites you to their next meeting! The presentation will be “Deaths by Suicide: Prevention Strategies in the Older Adult Population,” presented by Dr. Maria Kirchner. The meeting will take place from 2:00 to 3:30pm, at the NJ Division of Mental Health and Addiction Services, 5 Commerce Way – Suite 100, Hamilton, NJ 08691. Space is limited. Please RSVP by April 15. View flyer. Saturday, May 4 – NJ Center for Tourette Syndrome and Associated Disorders (NJCTS) has partnered with Virtua Health to provide the latest information about the signs and symptoms of childhood mental health disorders at the Childhood Mental Health Symposium at 8 a.m. on Saturday, May 4 at Rowan College at Burlington County’s Mount Laurel Campus. The symposium is open to pediatricians, neurologists, psychologists, counselors, school nurses, social workers, child study teams, teachers, college students and families. Topics covered by presenters will include identifying mental health disorders, treatments, medical management and prognosis. For more information and to register, visit www.njcts.org/cmhs. Saturday, May 11 – Caregiver Care Camp, organized by NAMI NJ, Rutgers Health, Rutgers School of Health Professions, and Division of Mental Health and Addiction Services. Saturday, May 11 – Somerset Patriots presents Mental Health Awareness Night with the Somerset Patriots. Download flyer. Saturday, May 18 – NAMI NJ Open House / Walk Rally. Contact Lisa Powell at lpowell@naminj.org for more information. June 19-22 – 2019 NAMI National Convention will be held in Seattle, Washington. This year’s theme is Our Movement, Our Moment. Learn more.